If you are in Bali and want to do a tour, I will gladly be your Bali tour guide and Bali driver: I will drive you around Bali, pick you up from the airport! My name is Gede Mardika, I am Balinese and I live with my family in Karangasem Amlapura. I love to show tourists from all over the world our beautiful island – Come as a tourist and leave as a friend. 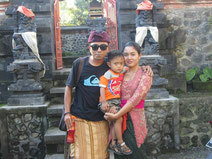 As a private Bali tour guide and your Bali driver I show you the real Bali, away from the typical tourists paths. I can organise very flexible the perfect tour for you, you tell me what you like to see and I advise you and offer you a tailormade tour – Let me help make your Bali dreams come true! Do you want to see the beautiful landscape with mountains, rugged coastlines and perfect sandy beaches, rice terraces and volcanos? Are you interested in our unique culture, which is very spiritual, social, warm-hearted and pictureresque? Do you want to visit some of he magnificent temples and palaces and experience traditional ceremonies? Maybe you are interested in arts and galleries or would like to buy some nice handcrafts? We have plenty of traditional dances and enchanting gamelan music to show you. Or are you more into nature walks, horsebackriding, diving or surfing? I can show you the best places. Do you like to see the best beaches, famous beaches with all kinds or restaurants and facilities or quiet, less crowded beaches? Enjoy the delicious authentic Balinese dishes, maybe you want to join a rural small celebration with „Babi Guling“ (suckling pig)? Do you want me to show you my village, get to know my family and learn something about our way of live? Contact me and can we start to plan your perfect Bali experience. Gede shows you Bali – I am friendly, reliable, funny, helpful and professional - and happy to welcome you soon. Me and my wife and son.